Your decision to buy a used automobile may save you hundreds or even thousands of dollars of the price of a new automobile! We all know that the main advantage to buying a used automobile is the greatly depreciated price. Another advantage is that you can research and choose a model automobile which has withstood the test of time. Along with all the valuable information included in this website is the opportunity to download the ebook with a checklist included. The checklist is a powerful tool that can help you discover these problems before you own the automobile. This will help you prevent those unexpected visits to your pocketbook. The checklist will help you inspect an automobile in an orderly manner by providing you with a list which includes the most common components on an automobile. The list provides space to literally “check” each item. There are so many components that make up an automobile, it is a necessity to have a checklist that will confirm a total automobile inspection. Everything you need to find a quality automobile is available on this website, downloading the checklist helps maintain this website and will make your inspection easier. The purpose of this website and downloadable ebook is to help the used automobile buyer find and completely inspect a used automobile in an organized manner. It will be useful both to the first time used automobile buyer and the expert. 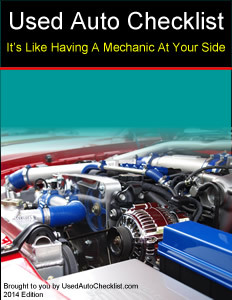 Realize the title of this website and ebook is Used Auto Checklist, meaning it can be used for SUVs, trucks, vans. The most important point to remember when looking for a used automobile is, you must have patience. Remember, you are looking for a used automobile because you want to save money. An automobile, even a used automobile, is a major purchase. Without patience, there is a greater chance the money you save up front will be lost in expensive repairs. This website and the ebook is divided into three main sections. The Part I shows you how to prepare to start looking for a used automobile. The Part II shows takes you through the different areas to inspect. Part III explains the mechanic's inspection and gives tips on negotiating. Take a look around. There is a lot a useful information available here.